Systematic evolution of a high-performance concept that enables superb track performance, everyday usability and comfort of a luxurious business sedan. M-Specific all-wheel-drive system for the first time: M xDrive with thrilling performance and power alongside superior handling. More powerful than ever: the new 4.4-litre 8 cylinder engine with M TwinPower Turbo technology with an impressive output of 600 hp. Delhi NCR. 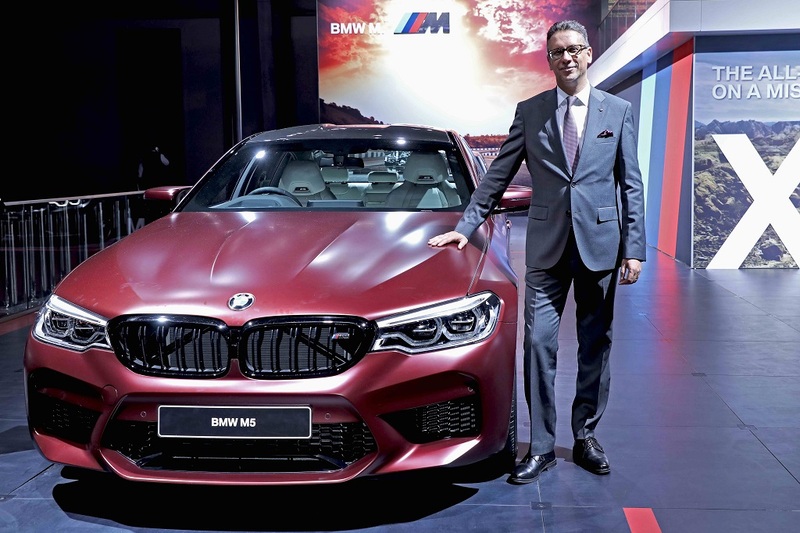 The sixth generation of the high performance sedan, the all-new BMW M5 was launched today at Auto Expo 2018. The all-new BMW M5 will be available at all BMW dealerships across India as a Completely Built-Up (CBU) model from today onwards. The all-new BMW M5 features the new M-specific all-wheel-drive system – M xDrive for the first time. With the M xDrive, the all-new BMW M5 can be piloted with the familiar blend of sportiness and unerring accuracy both on the race track and out on the open road, while also delighting drivers with its significantly enhanced directional stability and controllability right up to the limits of performance when driving in adverse conditions. Exterior of the all-new BMW M5 conveys power, elegance and aerodynamic refinement. Distinctive air inlets, a large kidney grille with double slats and an aluminium bonnet stress its dynamic proportions. For the first time, the BMW M5 features a roof made from extremely lightweight, high-strength carbon fiber reinforced plastic (CFRP). The redesigned rear diffuser, side skirts, the M rear apron and M rear spoiler, play their part in giving the all-new BMW M5 its commanding appearance. Automatic tailgate operation allows convenient opening and closing of the tailgate. The M sport exhaust system with four tailpipes underlines the high-performance appeal, delivering a distinct sound that can be modified via the integrated exhaust valve mechanism. The interior focuses squarely on the driver; absolute control in all driving situations is the motto here. The double-spoke design M leather steering wheel with multifunction buttons, the M emblem and chrome detailing feels great in the hand. Ambient light creates a relaxed, cosy atmosphere in the interior and features vicinity illumination in the exterior door handles. The M specific pedals and foot rest in stainless steel underline sporty aspiration and blend in with the exclusive business interior. The M specific digital instrument cluster exhibits the technological prowess of the all-new BMW M5. The new M multifunction sport seats with illuminated M5 logo and M Seat belts reinforce the car’s athleticism with multiple adjustment options allowing maximum comfort. The standard BMW Individual headliner in Alcantara Anthracite and the BMW Individual fine-wood trim plum brown high-gloss with highlight trim finisher Pearl Chrome, BMW Individual fine-wood trim Sen light brown and BMW Individual interior trim finishers piano finish Black are an absolute rarity that complete this expressive and prestigious ensemble. The all-new BMW M5 features innovative technologies such as BMW Gesture Control which is part of a rigorously thought-out operating concept that recognizes six pre-defined hand movements for control of a number of functions. All acceleration and braking actions are monitored and controlled by the Park Distance Control (PDC) with the Parking Assistant. The smartphone holder integrated into the centre console allows inductive, Wireless Charging for mobile phones and the BMW Display key. The BMW display key shows various information about the vehicle’s status and allows selected functions to be controlled with an integrated touch display. The M TwinPower Turbo 8-cylinder petrol engine in the all-new BMW M5 leaves nothing to be desired. The high-revving power unit delivers its exceptional output of 441 kW/600 hp at 5,600 – 6,700 rpm and a tremendous peak torque of 750 Nm. The boost in performance pushes the all-new BMW M5 from 0 to 100 km/hr in just 3.4 seconds for the ultimate adrenaline kick. The new 8-speed M Steptronic transmission with Drivelogic features extremely short shifting times and numerous shifting options from very athletic and dynamic to comfortable and fuel-efficient. The gears can also be shifted manually with the gear lever or via gearshift paddles on the steering wheel. The innovative M xDrive drivetrain system in the all-new BMW M5 combines the hallmark M agility and precision provided by standard rear-wheel drive with the traction-enhancing benefits of an all-wheel drive. The driver can choose from different configurations based on combinations of DSC modes (DSC on, MDM, DSC off) and M xDrive modes (4WD, 4WD Sport, 2WD). The configurations allow the drive system to be tailored to both the driver’s personal choice and the nature of the journey. Purists can opt for classical rear-wheel drive by deactivating the all-wheel-drive system. For utmost safety, the all-new BMW M5 comes with head and side airbags for driver and front passenger as well as head airbags for rear seats as standard. Additional standard equipment includes Dynamic Stability Control (DSC) including Anti-lock Braking System (ABS), Automatic Stability Control (ASC), M Dynamic Mode (MDM), Cornering Brake Control (CBC), Dynamic Brake Control (DBC), Dry Braking function and Active M Differential. 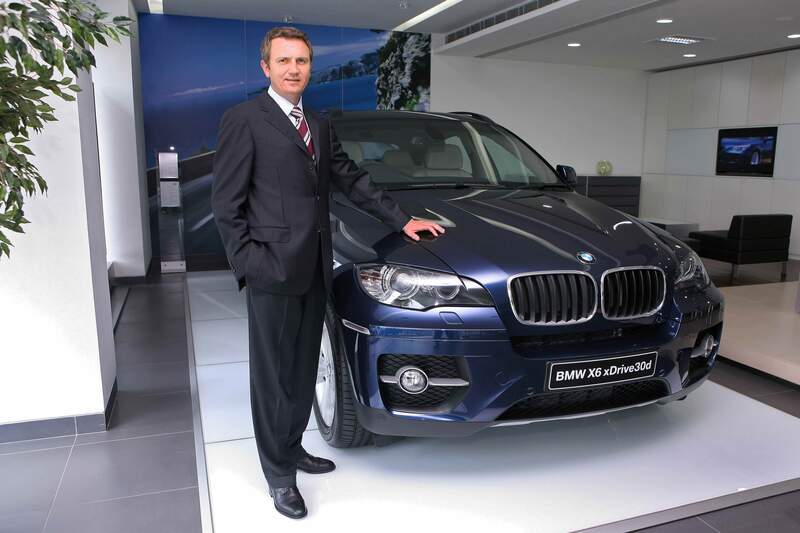 DSC with M xDrive further enhances the safety aspect. The all-new BMW M5 delivers maximum driving pleasure coupled with an outstanding performance and fuel consumption ratio thanks to BMW EfficientDynamics measures such as intelligent lightweight design, Brake Energy Regeneration, Auto Start-Stop function, electric power steering, differential and transfer case with optimised warm-up behaviour and aerodynamics (underside panelling, front spoiler, rear spoiler). The all-new BMW M5 is equipped with a wide range of BMW ConnectedDrive systems like the BMW iDrive Touch, BMW Navigation System Professional (with touch functionality), 16 loud speakers with 600 Watts high-end Surround Sound system from Harman Kardon, BMW Apps, Apple Car Play, BMW Head-Up display and the optional Bowers and Wilkins system. 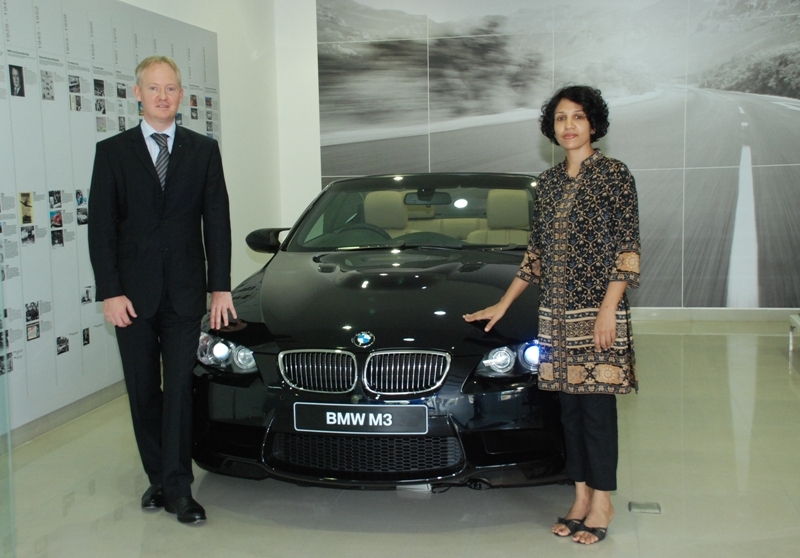 The all-new BMW M5 is available in a petrol variant at an ex-showroom price of INR 1,43,90,000. *Price prevailing at the time of invoicing will be applicable. Delivery will be made on ex-showroom price. Ex-showroom price (inclusive of GST (incl compensation cess) as applicable but excludes Road Tax, RTO statutory taxes/fees, other local tax/cess levies and insurance. Prices and options are subject to change without prior notice. For further information, please contact your local authorized BMW Dealer. The all-new BMW M5 is available in a range of fine upholstery combinations – Leather ‘Merino’ with extended contents Silverstone / Black, Leather ‘Merino’ with extended contents Black / Black and Leather ‘Merino’ with extended contents Aragon Brown | Black and optional Leather ‘Merino’, with extended contents Black | Black, Full leather ‘Merino’ Silverstone | Black, Full leather ‘Merino’ Aragon Brown | Black, Full leather ‘Merino’ Black | Black. 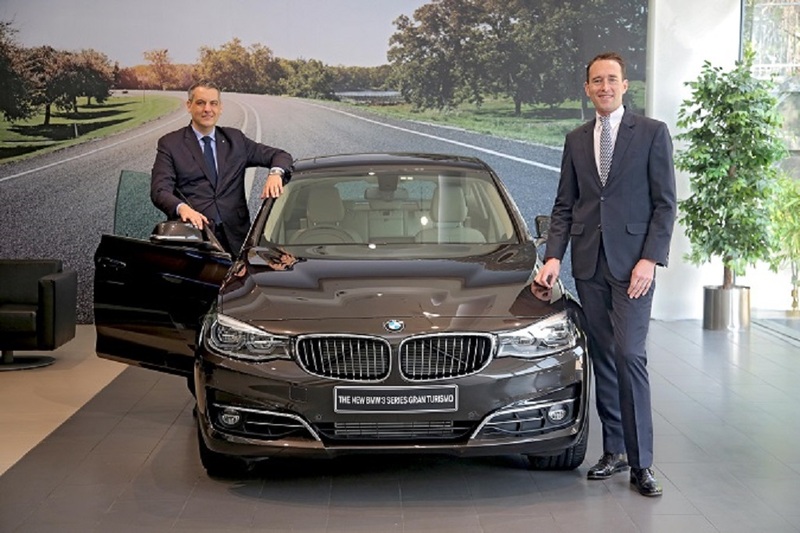 The high-end workmanship is enhanced by optional BMW Individual fine-grain ‘Merino’ leather upholstery in Smoke White / Black, Caramel / Black and Tartufo and Black.